Traditionally Māori cooked in a hāngī (earth oven), or over a fire. The first Europeans in New Zealand cooked outdoors over open fires. Later they used Dutch or camp ovens (lidded pots on legs) and colonial ovens (cast-iron boxes with a fire heaped over). In the 1850s cast-iron ranges were installed in some houses, but they smoked and dropped soot because of New Zealand’s soft coal. In 1873 Henry Shacklock designed the Orion range to work with local coal. Gas stoves were introduced in the 1860s after coal gasworks were set up in cities, and electric stoves arrived in the 1920s. Their temperature gauges made cooking more accurate. Microwave ovens became common in the 1980s. Baking cakes and biscuits is an important part of New Zealand cooking. Cake tins were kept full for visitors. Home baking was displayed at A & P shows and at morning and afternoon teas. Meat – often lamb or mutton – was roasted for Sunday dinner. Vegetables were often boiled until limp, and puddings were sometimes steamed. Fruit and vegetables were preserved for future use, in syrup or as jam or chutney. In the 2000s people also preserved food by freezing it. Settlers brought recipes with them in published or handwritten cookbooks or in their heads. New Zealand’s first proper cookbook was published in 1887. Later, cookbooks were written to suit New Zealand tastes and climate. 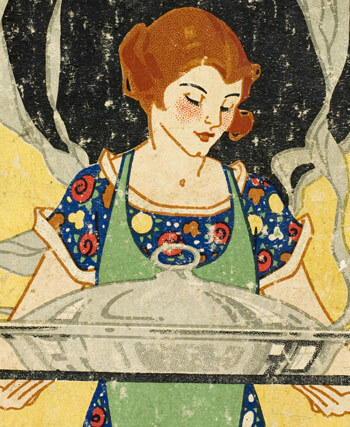 The Edmonds cookbook first appeared in 1908, and is still a best-seller. From the later 20th century cookbooks included recipes from international cuisines. Television cooking shows were popular from the 1960s. Cooks included Graham Kerr, Peter Hudson and David Halls, and Alison Holst. Cooking at home has mostly been done by women, who learnt by helping their mothers. Girls were also taught to cook at school. As more women took up paid work from the 1960s, they cooked less time-consuming dishes. Single men cooked for themselves. Men who worked in isolated areas – such as hunters, gum diggers or sawmillers – also cooked. Barbecues were introduced in the 1950s, and men often did the barbecueing.